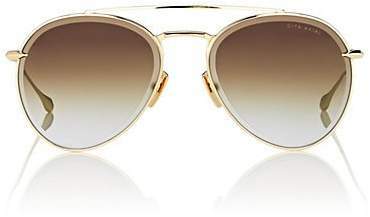 Crafted of polished goldtone titanium, Dita's Axial sunglasses are equipped with UV-protective gold gradient mirrored lenses finished with the eyewear label's signature Step-Down detail. 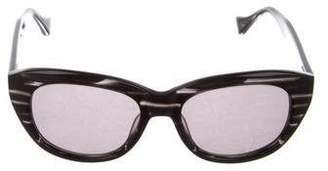 A recurring design element for the L.A-based brand, the matte beveled edges give the lenses an elevated, multi-dimensional effect. Logo at lens corner. Logo insignia at temple tip. Aviator style. Brow bar. Nose pads. Sculpted temple tips. Gold gradient mirrored lenses. 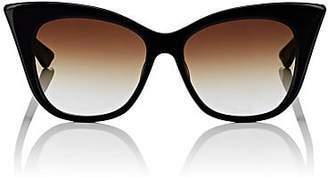 100% UVA and UVB protection. 57mm eye size. 17mm bridge size. 145mm temple size. Available in Goldtone. Titanium. Made in Japan. Includes hard protective case and cleaning cloth. 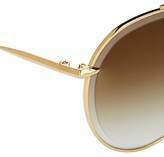 Dita Women's Axial Sunglasses - Gold A great designer gift. Shop Dita at Barneys New York.